Jason Lee Lands New TV Series!!! Jason Lee is set to play the lead in a new series for CBS called ‘Second Sight‘, which is a drama from Michael Cuesta and Carol Mendelsohn. This new series is actually based on a British series from the year 2000 and is described as a gothic psychological thriller. ‘Second Sight‘ follows a guy named Tanner (Lee), a detective with the New Orleans police department with a unique gift. He has an ocular disorder that causes him to have horrific hallucinations, which might actually help him in his cases. The part of Tanner from the original series was played by Clive Owen. Cuesta will direct the pilot from a script he wrote. You might recognize Cuesta’s name from ‘Homeland‘ and ‘Dexter‘ and Mendelsohn is haevily involved in the ‘CSI‘ shows. This could be very good, considering the talent. 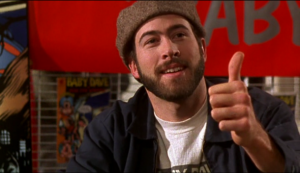 I just want Kevin Smith to write a film starring Brody, titled ‘The Chocolate Covered Pretzel’. Is that too much to ask? This entry was posted on Wednesday, February 20th, 2013 at 1:46 pm	and is filed under News, Television. You can follow any responses to this entry through the RSS 2.0 feed. You can skip to the end and leave a response. Pinging is currently not allowed. « Check Out the Scary Trailer for ‘Sanitarium’!!! Excuse me, Ron, I need to use the bathroom. I think it's the pâté. Thanks! Stuff probably looks better on the way out, huh?